Hair: Black, straight and hanging to just below the shoulders. She wore a headband to keep it out of her face. 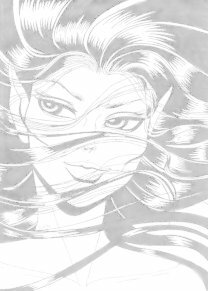 Life history: Dodia was one of Dart's Jack-wolfriders, making her first appearance when her Jack-wolf Skimsand killed Skywise's wolf Starjumper in a challenge. She later joined Dart's band to rescue Windkin from the Forevergreen and ended up Recognizing Door there.